The following article is for Customer's on our Cloud VM hosting with Plesk. A WordPress theme determines the overall design of your website including colors, fonts, and layout. By selecting a different theme, you change the look and feel of your website without changing the content. With WordPress Toolkit, you can install and manage themes. Search for and install themes found in the wordpress.org themes repository. Install themes uploaded by the Plesk administrator. Upload custom themes, which is useful if you cannot find a suitable theme in the wordpress.org repository or if you need to install your own theme. Go to WordPress, go to the “Themes” tab of an instance card, and then click Install. Search for themes, and then ñlick Install next to the theme you want to install. By default, a newly installed theme is not activated. Go to WordPress > the “Themes” tab, and then click Install. Search for themes, and then select the themes you want to install. Note: Selecting one or more themes and then performing a new search without installing the selected themes resets the selection. Click Install on all ... instances. Go to WordPress > the “Themes” tab. Click Install next to a theme marked with the icon. If you see no such icons, it means that the Plesk administrator has not uploaded any themes. Select the WordPress instances on which you want to install the theme. By default, a newly uploaded theme is not activated. You can activate it by selecting the “Activate after installation” checkbox. Go to WordPress > the “Themes” tab, and then click Upload theme. Click Choose File and browse to the location of the ZIP file containing the theme you want to upload. Click Install next to a theme you have uploaded. 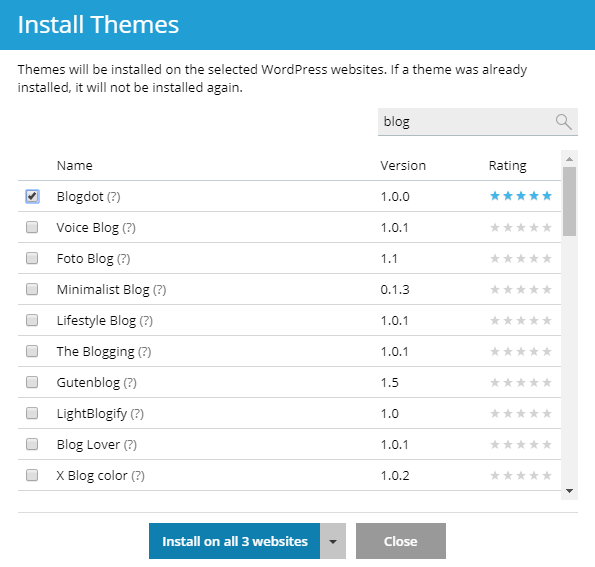 Select the WordPress instances on which you want to install the uploaded theme. You can activate a theme installed on a particular instance or on all instances hosted on the server. A WordPress instance can have only one active theme at a time. Go to WordPress, and then go to the “Themes” tab of an instance card. Switch on a theme to activate it. The theme that was previously active will be automatically deactivated. Click Activate next to a theme you want to activate. You can remove themes from a particular instance or from all instances belonging to a subscription. Note that you cannot remove an active theme. Before removing a currently active theme, activate another theme first. Click the icon next to theme you want to remove. To remove several themes, select them and click Remove. Select the themes you want to remove, click Uninstall, and then click Yes. Update themes for one particular instance. Read how to do so in the “To update a WordPress instance manually” procedure. Update themes installed on multiple instances. Configure automatic updates for themes. Read how to do so in the “To configure automatic updates for a WordPress instance” procedure. Click Update to version ... next to the theme you want to update. To learn more about the update, click View Details. This will take you to the theme's page on wordpress.org. Note: Before updating the theme, WordPress Toolkit will prompt you to back up your subscription. If you are concerned that the update may break your website, create a backup or use Smart Updates.